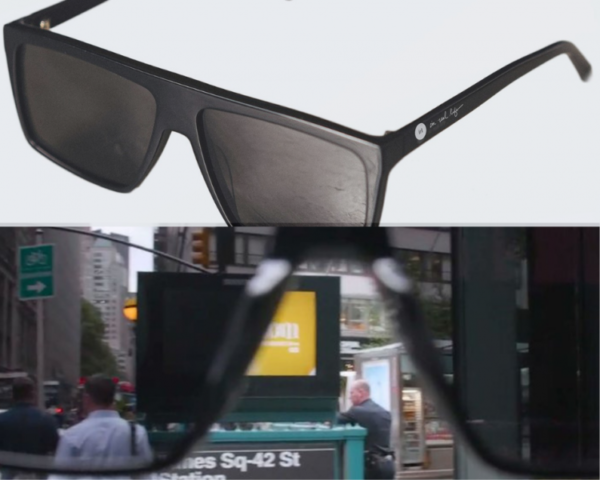 Glass Story– These Sungasses really block screens around you they came in to existence by Scott Blew, once he was standing in line at a food truck in Los Angeles he caught the glare of Fox News on a television out of the corner of his eye. This is ridiculous, he thought. He couldn’t even ignore the deluge of the news, or the presence of screens, on a journey outdoors to get lunch. You can put your phone away but if some other screen pops up around you, it may draw your attention. Blew Once read an article in wired.com about a new kind of film that blocked the light emitted from screens. Blew wondered if the same might work on a pair of glasses, to block the screens that seemed to be everywhere. He than ordered a sample from company that made the Casper screen-blocking film. Then he replaced the film from the sample in a pair of cheap sunglasses. astonishingly, it worked: Blew could look through the lenses and see everything—except for screens, which turned black. Cash and Blew have found that strangers stop them to ask about Glasses, or laugh when they recognize the design reference to They Live. Not everyone agrees with the assumption. Cash says he’s received few emails pointing out that people can turn off the TV without wearing a pair of special sunglasses. Cash says he likes that feedback as much as anything else. That’s what the glasses are for: continuing the conversation about how much screen time is enough. Stay tuned with Alloftop for more!